Space Pirates aren’t supposed to exist. But apparently, nobody told them that. 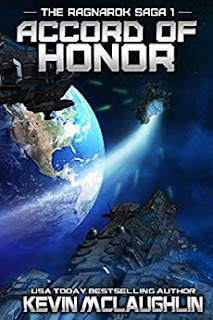 When Thomas’s first command is ambushed in space, only quick thinking will keep his crew alive. One random pirate ship would be bad enough, But the truth is far more deadly. Multiple ships of unknown origin are striking freighters and kidnapping their crews. Then the pirates turn their eyes toward the planets. One man has prepared for this; Thomas’s estranged father, Admiral Nicholas Stein. Hero and villain of the last great war, he has spent decades preparing for the conflict he always knew was coming. Now he and Thomas are all that stands between humanity and a ruthless enemy who will stop at nothing to control space - and from there, to enslave us all.